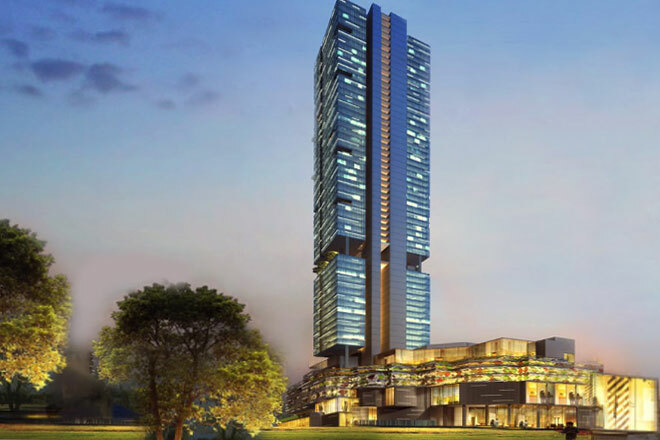 Oct 06, 2015 (LBO) – Apartment complexes have had a strong hand in shaping the skyline of Colombo with the island’s real estate and construction industry sectors presently experiencing a boom. The key market drivers remain the luxury condominium market which has picked up within the last year. However, experts warn that buying by expatriate Sri Lankan and foreigners who are driving the condo market may have peaked or may be nearing its peak due to their finite numbers. Data shows that in 2009 the luxury housing stock stood at 783 units and by 2015 the number has gone up to 2,657. By the end of 2018-19, the numbers are expected to hit 6,000, when projects such as Altair, Shangri-La, Colombo City and 96 Iconic are completed. The recently implemented law on land acquisitions prohibits acquisition of immovable properties by foreign citizens. Exemptions to this prohibition on foreign ownership include diplomatic missions; international, multilateral and bilateral organizations; and condominium apartments on or above the 4 floor. In Commercial property the story is different with data showing that the market has been dealing with an acute shortage in supply of grade “A” space in and around the city for several years. What are the factors affecting Sri Lanka’s real-estate market? As with any market, different factors or parameters will affect different market segments. If we take the mass market for housing which is largely driven by housing loan facilities, then we must first consider the impact of interest rate movements in the macro-economy level. At the upper end of the market, the sentiments towards investing in luxury apartments are driven by many factors such as life styles trends and the driving forces include local high-net worth individuals, dual citizens and non-resident Sri Lankans as well as foreigners who are looking to work and/or live in Sri Lanka. The demand for commercial office space is again driven largely by macro level factors that include the state of the macro-economy as well as sector-wise performance. The Banking and Finance, Tourism and IT / ICT sectors are amongst the leading industry segments that are driving the demand for grade A office space in Colombo. Do you see supply overtaking demand in the luxury/high end residential market? In our RIU Annual Real Estate Market report 2015, we have highlighted the possibility of over-supply at the very top end of the market. This is due to the fact that current supply at the top-end of around 3000 units will double by 2019 to around 6,000 units. The top end of the market is primarily focused in and around the central Colombo areas and offers all the trimmings of a modern life-style and great views, proximity to work, school, ect. The danger of over-supply is directly a function of the stability of macro-economic growth in Sri Lanka. If there are any internal or external shocks that may cause any hiccups to the post-war rapid economic growth, we will need to be concerned about over-supply. However, if we assume that the current macro-economic trends will continue, I don’t think we need to be concerned about over-supply. In the long-term, the ability to resolve challenges such as rising traffic congestion in and around the city will have a significant impact on future demand. Are the middle income earners being priced out of the city’s property market? What are your suggestions for this? Good question and yes, to some extent the middle-income segment is being priced-out of the central areas of the capital. However, as horizontals developments get converted to vertical buildings, more inventory will be added and some of this stock will also target the mid-level of the market. There is no quick-fix solution to this issue as the market will always dictate the price and positioning of the products on offer. We cannot super-impose middle income developments into central areas through planning. What we need to focus on is for the current transport and infrastructure to be boosted in order to be able to handle the inflow of mid and lower level commuters into the city from the surroundings suburban areas. Currently, commuters have to travel for 1-2 hours in the morning just to get to work on time. This trend is deteriorating by the day and much needed investment into new modes of transport and smart city concepts are the urgent need of the hour for the mid and other segments of the market. Describe the commercial property market in Sri Lanka, what is demand like? The top end of commercial space offers around 2.5 million sq. ft. of space in total provided by around a dozen developments. The World Trade Centre tops the list for aggregate capacity with a total of over 700,000 square feet available for commercial purposes. The prevailing rental rates show that the WTC is still well ahead of the pack. Looking at the overall rental price levels, we can note that the market has enjoyed exceptional price hikes over the past five years. If we note that the average square foot price for high-end office space in Colombo was around 70 rupees to 100 rupees in 2007 (RIU Report 2009), then the prevailing average of around 200 rupees to 220 rupees represents phenomenal price growth of around 15-20 percent per annum as forecasted by the RIU Real Estate Market Report in 2011. This price surge is due to the fact that the market has been dealing with an acute shortage in supply of grade A space in and around the city for several years. With occupancy at the top facilities close to 100 percent, those seeking large space have had to settle for the middle market, both in the city and in the suburban areas. The smaller firms and start-ups have taken up residential properties that have been converted to office space. Where do you see the future of the real estate market in Sri Lanka? The future is promising subject to important infrastructure issues being addressed. In addition to the transport challenge as mentioned earlier, we need to introduce more green spaces in and around the city. The current design, or the lack thereof, makes limited allowances for leisure and recreational spaces within the city and suburban areas. Furthermore, many roads in the suburban areas have little or no pavements leaving pedestrians to use the main roads for walking. Another negative aspect of the city and surrounding areas is the dominance of horizontal developments that occupy space along all of the major roads. These can be replaced by concentrated and multi-functional developments that can house retail outlets, commercial space and public administration services. A switch to concentrated and centralized buildings of this nature will free up more green areas and enable people to drive or use public transport conveniently to attend to their shopping and other activities more efficiently. This is a challenge for the town planners and we believe that the Megapolis approach is the right way to go about addressing the bigger issues. Anything else you would like to add in terms of Sri Lanka’s real estate landscape? At RIU we feel strongly about eco-concerns and in this connection, introducing cycle lanes is crucial to the future development of the city. Providing safe cycle lanes will serve to ease traffic congestion and promote a healthier environment for all who live and work in Colombo. In our research we have found that a small but growing number of people have already opted to cycle to work including myself, despite the lack of cycling infrastructure. The time saving from cycling as opposed to driving can be as high as 50 percent. In addition, we have found that tourist love to cycle in the city and if better infrastructure is made available, this would add significant value to the city’s attractiveness as a leading city in Asia.